At the start of this ongoing series, my intent was to survey the current informed conventional wisdom, as it has evolved over the last decade at places like SFConsim-l, and presented at the invaluable Atomic Rockets website. This conventional wisdom is rather ... austere. The cold black depths of space, far from being concealing, merely cause spaceships, inevitably bright in the infrared if not visible light, to stand out against the darkness. Plausible weapon ranges are so great as to make even space speeds seem sluggish, and render anything like classical tactical maneuver impossible or irrelevant. The tactical problems posed by open space combat under these conditions are ideally suited to automated and remote systems, without calling for any remarkable advances in AI - and leaving little reason to put human crews aboard combat spacecraft. Hardly the stuff from which good schlock adventure is made, but the logic of physics and non-magitech engineering pushes relentlessly in that direction. Then along come Somali teenagers with not much to lose, and Somali businessmen (in loose but accurate usage) with a good deal to gain, and suddenly future conflict looks more complicated. Here on Earth, naval planners find themselves concerned about the ability of 21st century warships to deploy boarding parties. Outer space does not much resemble the waters off Somalia, but there is a lesson here: Solutions depend on the problem you are solving. The ability to detect a spaceship a billion kilometers away does not mean you know who is aboard, and while you know where they are going you don't know what they mean to do when they get there. There are times when simply zapping or whacking a ship from Stupendous Range won't do, and you'll need to look for an opportunity to try something else. There are still constraints. Hijackings and boarding parties belong to that ambiguous zone where combat meets police work. In game terms these sound more like RPG scenarios than classic board wargames. If you want World War II in SPAAACE !!! - constellations of laser stars battling it out - you are pushed back toward engagements of mostly robotic forces at Stupendous Range. Which still has its own problems. In our last exciting episode, commenter Z suggested that 'this isn't a fight anyone would show up for.' I'm not entirely sure of that. People in the 18th century built and besieged Vauban forts, even though the 'art of fortification' in that era was almost Newtonian in its determinism. What no one does is write stories about sieges of Vauban forts. Instead people write stories about a different 18th century war technology, the frigate. Now let's go a bit meta. 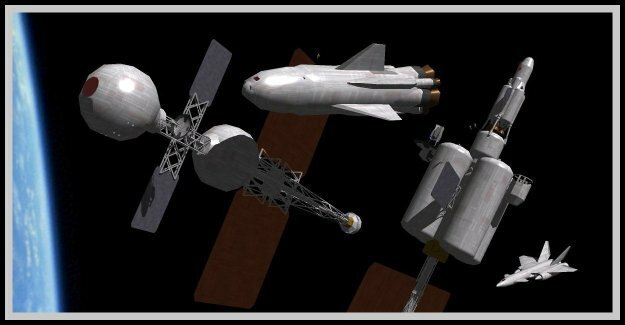 This blog straddles two quite distinct projects: the human future in space, and Romance concerning the human future in space (AKA space oriented SF). Straddling them - however uneasily - is nothing new; they are almost inextricably entangled. Most of us got our ideas about the space future from SF, and has it shaped what we expect or hope for. Take for example colonization. We explored Earth's poles, and conquered the slopes of Everest - environments that, in solar system perspective, are nearly indistinguishable from Tahiti - without any thought of colonizing them. In fact we have established a thriving permanent presence in Antarctica without 'colonizing' it. Last year I proposed a sort of alt-future in space, one in which resource extraction and colonization (if they happen at all) are incidental byproducts of a human space presence, not its central thrust. This would be as vibrant a space future to live in as the traditional one - but like robotic space battles it is not much to write stories about. No one writes adventure schlock about the Antarctic Patrol. 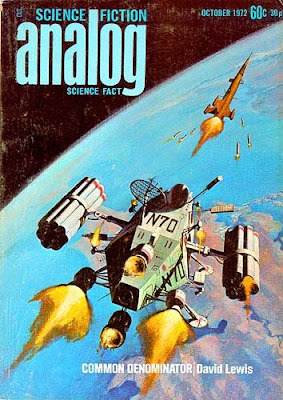 Truth to be told, no matter how much we tart up our stories with Realistic [TM] scientific and tech speculation, they are all space opera at heart. And so we will go on trying to come up with plausible sounding scenarios for people in space to bash away at each other in various dramatic ways. Related posts: A Solar System for this century, and - from the earliest days of this blog - thoughts on the genre with no name. 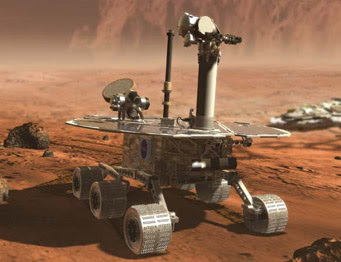 It has been just over six (Earth) years since the Spirit and Opportunity rovers landed on Mars. Both have far, far outlasted their warranty, helped in part by dust devils that handily blew dust off their solar panels. Now, via Sky and Telescope, comes word that Spirit has reached highway's end, not quite seven kilometers from its landing place. Like many a pioneering terrestrial motorist, its joyriding days ended in a sand drift. But if Spirit's motoring days are over, its exploring days happily are not. It will continue operating as a fixed radio beacon on the Martian surface, permitting precision measurements of Mars' rotation that can help to determine whether it retains a liquid core. 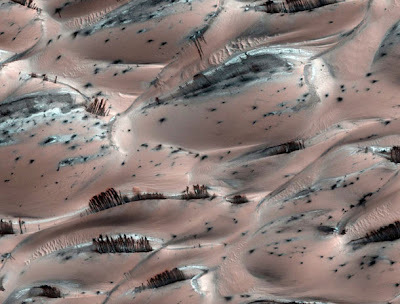 Related posts: Weather and landslides on Mars. If in a mere 60 years we've learned enough that the predictions of the Futurists then have become "zeerust" today, how long before the predictions on this very blog become subject of ridicule and sympathy directed at our naivete? In fact, of course, it will be exceedingly cool if, 60 years from now, anyone who stumbles across this blog finds it quaintly amusing rather than merely old, irrelevant, and dull. The future, as I noted in the early days of this blog, has a rather brief past. In fact, the past itself hasn't been around all that long either, not in the sense that we now say that the past is a foreign country. Sometime in the Renaissance, artists figured out that Romans didn't wear doublets and hose, but Sir Walter Scott, so far as I know, was the first author to reconstruct a past unlike his own era. Mary Shelley probably gets credit for the first true work of science fiction, but it was set in her own present. Even Verne's famous works weren't futuristic as such, or at most were set 'the day after tomorrow.' His Paris in the Twentieth Century is a true SF future world, but in a strange twist on futurism it sat in a drawer for generations and was published only in 1994, by which time Paris was nearly out of the 20th century. It is an odd fact that the retro-future of 110 years ago gets much more positive treatment than the retro-future of 60 years ago does. Aether ships are charming, atomic cars are silly. This, I imagine, is for a couple of reasons. One is that in spite of occasional historical artifacts like the image above, our picture of the steampunk future is largely a modern re-creation - 2010 imagining 1900 imagining 2000. The rocketpunk era future, by comparison, is all too well represented by genuine artifacts, many of them embarrassing. The Jetsons alone wrought incalculable damage, making it difficult for an entire generation to take the future seriously. You could argue, in fact, that the future is a dead concept in the popular culture, buried when Tomorrowland was recast with a steampunkish retro theme. Indeed there has been a distinct fin de millénaire distaste for the whole boring old concept of the future, from the End of History (remember that?) to Left Behind, to SF's own Singularity. But history, as you may have noticed, failed to end, suggesting that even the future may still have some life in it. What current prediction, on this blog or elsewhere, will sound silliest by 2110? 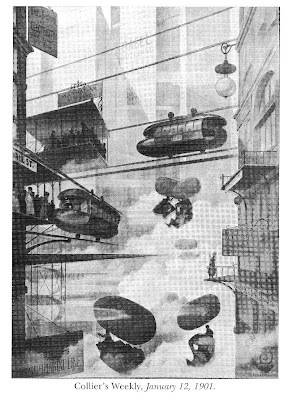 The image (via Paleo-Future) suggests that the City of the Future, with its 50th floor skyways, was already an established trope by 1900 - I had thought it dated only to the film Metropolis (1927). Note the combined above-and-below monorails, heralding the future in all their wonderful impracticality. Related post: The view from 1900. A belated welcome to the New Year and a new decade* - it's got to be an improvement on the last one. This estimate comes from microlensing, a technique aptly described as 'looking for planets you can't see around stars you can't see.' The method relies a flukish event, a star passing in front of a more distant star and, through gravitation lensing, allowing us to briefly register the presence of the distant star and any planets around it. The planets aren't really discovered in the traditional sense, only glimpsed, but with a galaxy full of stars, flukish revealing glimpses happen often enough to be treated statistically. Which is pretty cool when you think about it. But my text for the day, so to speak, is the generous interpretation of 'like ours'-ness. I remember back before 1995, when it was pretty much taken for granted that most planetary systems would be variations on a theme - about 5 to 15 major planets, most in nearly circular orbits, arranged as a few rocky inner planets, then a handful of gas giants, then some icy outer bodies. The first extrasolar planets were found in 1993. They orbit a pulsar, a discovery so plain weird that both astronomy and science fiction mostly blinked and ignored it. We wanted real planets around real stars, not cinders left over from a supernova. Then came 51 Pegasi b, a planet that would have been been laughably unbelievable until it was discovered. Of the 350 or so planetary systems now known, some 50 with more than one (known) planet, hardly any fit the solar template. This is not statistical evidence, because most were discovered using techniques (radial velocity and transits) that favor discovery of big planets close in to the parent star. But this is still a LOT of planetary systems that don't fit the expected mold. The most surprising thing to me, besides the hot Jupiters, is the prevalence of eccentric orbits. Very few known extrasolar planets have orbits resembling Solar System planetary orbits. Nearly circular orbits are common enough, but mostly for close-in planets whose orbits have been tidally circularized. One tantalizing hint, unrelated to the linked story, might suggest a pool of planetary systems more like ours. At the Extrasolar Planets Encyclopedia they have a nifty little graphing tool. Plot semi-major axis (i.e., average distance from parent star, in AU) against orbital eccentricity. You'll see first of all that most planets discovered so far are within a few AU of the star, with a handful detected at dozens of AU. Their orbits also have a wide range in eccentricity. Now set the distance bounds at a minimum of 1 AU and maximum of 6 AU, excluding the close-in planets and a handful of remote ones. The (few) planets discovered between 4 and 6 AU, where giant planets form, tend to have less eccentric orbits than those inward of them, which got there by migrating. Is this significant? I don't know, but these worlds are recent discoveries. More beyond! * Cheerfully ignoring chronology pedants. 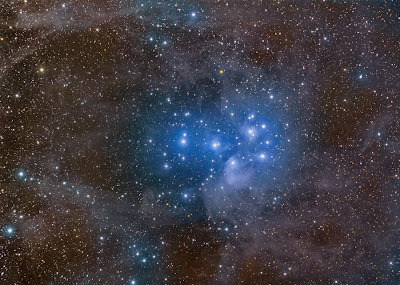 The image of the Pleiades, from Astronomy Picture of the Day, is irrelevant but gorgeous. Related post: Last August I looked at exoplanet destruction.